If you’re getting ready to open a School Store in your high school, or re-vamp the one you have, these eight tips will help your store be profitable and rewarding. Start by creating a business plan. Better yet, have your school store manager create one. It can be simple or extravagant. You’ll want to calculate costs, potential profits, and outline a general plan of action. Location is as important for a school store as it is for real estate. If you don’t have a designated spot for your store, it can be as easy as setting up a table in a hot location. Think about high traffic areas such as busy hallways, lunchrooms, or activity areas. Another key factor in determining success is making sure your store is accessible to students. Choose one or two key days per week, or a couple of optimal hours each day. Consider before and after school, and during lunch. Be sure to schedule hours during activities outside the school day such as open houses, athletic events or concerts. You may also want to consider having special extended hours during peak times such as Homecoming and Spirit Week. If you are just starting out you’ll want to start with the basics. As you begin to see profits you can re-invest in new and exciting stock. Bringing in new items helps keep interest and excitement high. If you’re on a tight budget start with items in your school colors to save money on the imprinting. Later, you can add items with your school name, logo or mascot. We all know that life exists online for most people. Find a way to give parents and community members access to your store online. Some options include a weekly email with current “specials”, an actual website for your store or a page on your schools website and social media such as Facebook and Twitter. The more ways you reach parents, the more excitement you’ll see and the more profits you’ll generate. Some of the old tried and true methods of advertising still work. Students can create posters and banners to hang throughout the school and run ads in the school newsletter. Offer specials and promotions each week or month. Sell gift certificates that can be purchased. Enjoy the spirit of the project. Don’t get stressed out or bogged down with the details. Let the students sail the ship; you just provide the map to do so. In the end you’ll have a successful school store, gain immeasurable experience for the kids and help promote school spirit and morale among the entire student body and staff. 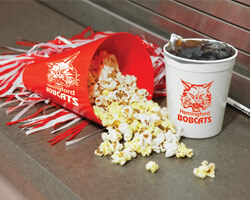 Check out our School Store section to stock up on all your school store items now!